Frank Lloyd Wright's Los Angeles houses are must-see gems in the famous metropolis of Los Angeles. You can tour only one of them. The rest are private homes not open to the public, but that won't stop you from driving by and admiring the architecture from the street. You can see all of Frank Lloyd Wright's Los Angeles houses in a well-planned day. Some of the homes perch atop the Hollywood Hills with magnificent views of the city below. Others are in an elegant area of Pasadena that any architecture lover will enjoy visiting. If you only have a couple of hours to spare and you want to see a Frank Lloyd Wright home, opt for the Hollyhock House where you can take a guided tour. Built between 1919 and 1921, it represents Wright's efforts to develop a style of architecture for Southern California. Named after original owner Aline Barnsdall's favorite flower, Hollyhock House was just part of a living and arts complex set on 36 acres. It was Wright's first commission in Los Angeles and one of his first open floor plans. Today, the house recognized by the American Institute of Architects as one of the seventeen Wright buildings that are representative of his contribution to American culture. The main house is open for tours, and three other buildings still stand on the site: the main house, the garage and chauffeur's quarters, and the so-called Residence A, which was built for artists' living quarters. The Rodeo Drive shops called Anderton Court are a little-known Wright design and not widely recognized as one of his better works. Multiple modifications obscure the original facade, but you can still see hints of the tower designs he repeated in other structures. Decorative elements include piers that taper downward and chevron patterns on the central spire and edges of the roofline. Today it is home to a few small offices and a salon. Ennis House is located at 2607 Glendower Ave, Los Angeles. This large and lovely home is on the National Register of Historic Places. It is also a Los Angeles Cultural Heritage Monument and a California State Landmark. After some devastating damage and a long search for the right buyer, the house was sold and was under renovation. Frank Lloyd Wright’s Ennis House, which served as a location for films such as “Blade Runner,” has was sold to billionaire Ron Burkle, founder of the Burkle Foundation and a trustee of the Frank Lloyd Wright Conservancy. After the project is complete, Ennis House is expected to be open to the public a few days per year. The Freeman House located at 1962 Glencoe Way in Los Angeles is one of three textile block houses Wright designed in the Hollywood Hills in the 1920s. The house was listed on the National Register of Historic Places in 1971 and has been listed as a California Historical Landmark and as Los Angeles Historic-Cultural Monument. 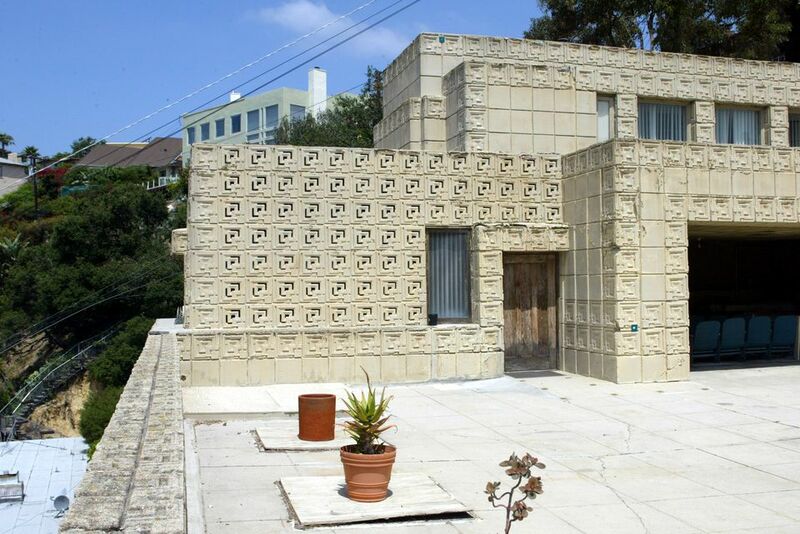 The textile block design homes are examples of Wright's pre-Columbian inspired or early Modernist architecture. In 1986, the Freeman House was bequeathed to the USC School of Architecture. After the completion of renovations, the university plans to use it as a residence for distinguished visitors, as well as a setting for seminars and meetings. It is not open to the public. The Storer House found at 8161 Hollywood Boulevard in Los Angeles is known for its drama. Although Wright believed in designing structures that blended seamlessly into their natural surroundings, this 3,000-square-foot house does anything but. One of the four textile block Wright houses in this pre-Columbian-inspired style in the Los Angeles area, the Storer House is unique because of its four-block designs. The Storer House was built on a steep hillside in the Hollywood Hills. Dramatic for the era, the house was compared to a Pompeiian villa. It was surrounded by jungle-like lush landscaping which gave the illusion of a hidden Mayan ruin. The Storer house is a private residence and not open to the public. Located at 32436 West Mulholland Highway in Malibu, this complex was badly damaged during the Woolsey Fire in late 2018. Its fate is uncertain. Its started as the grand "Eagle Feather" project that included a studio, house, stables and more designed for a radio personality, movie and early television director/producer Arch Oboler and his wife Eleanor. However, only a gatehouse and a small studio were actually built. The Arch Oboler Gatehouse and Eleanor's Retreat buildings are the only example of desert rubblestone construction, the same style Wright used at Taliesin West in Scottsdale Arizona. The builders sourced materials from the surrounding area to make it feel as if the buildings were an extension of the desert floor thus the "rubblestone" moniker. The Sturges House located at 449 N. Skyewiay Road in Brentwood Heights, is considered a masterpiece of American design, often compared to Wright's legendary Fallingwater in southwest Pennsylvania. This was Wright's first Usonian-style structure on the West Coast with a design that seems to grow out of the side of the hill. Usonian was a term Wright coined for more modest, middle-American homes. The one-story home is fairly small, 1,200 square feet, but the outdoor space more than makes up for it. The concrete, steel, brick and redwood home features a 21-foot panoramic deck. The Wilbur C. Pearce House, located at 5 Bradbury Hills Road in Bradbury, is hidden inside a gated community. It's listed as a Frank Lloyd Wright design but doesn't look like one. And it's almost impossible to get through the gates to see it unless you live there. The Wilbur C. Pearce house has been owned by the same family for three generations and they are active in the restoration of the property. The home has Wright touches including the indoor-outdoor feel. The home is one of only 60 Usonian houses that Wright built in the United States. The Millard House, also known as La Miniatura, located at 645 Prospect Crescent in Pasadena, sits on an acre of gardens and offers beautiful views. It is listed on the National Register of Historic Places. This is the first of the textile block house designed by Wright who was, at the time, experimenting with concrete building materials and using Mayan and Aztec symbols and designs to decorate them. Wright was commissioned to build Millard House by Alice Millard, a rare-book dealer after he built a home for her in Illinois twenty years prior. The home was built in 1923 and it was listed on the National Register of Historic Places in 1976. It is not open to the public.